Here are some items that seem to give Players the most trouble: If these could be increased in the future that would be great! Also for many players the hassle for the Tm experience isn't worth the time and effort when doing the Grass quests. My apologies if the Links work or not. There based off of ggftw. Does the poppuri in event garden exchange w/g elixer to w/g elixer ev? or w/g elixer ev to w/g elixer? If not I want to suggest to make the Poppuri exchange w/g elixer to w/g elixer ev , w/g elixer ev to w/g elixer. I usually hunt bosses and as a result in my inventory full of boss path questies so I suggest how about we can put our boss questies to our bank & storage? thanks. Please can you list down specific quest items? I work better that way. 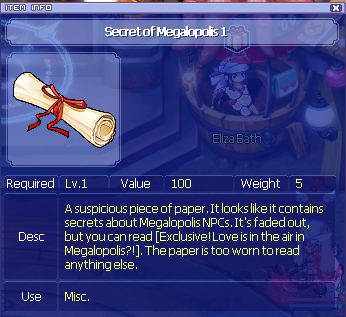 Anyone who knows all the boss quest items can post in this thread. Please specify which boss, and please use correct name of items so that I can check in database. I know its really early but please bring the naked boxes back maybe for next patch. As I said before, this is probably December maintenance or January (I'm leaning more towards December as of now). Please suggest some other box for November. I still haven't received good suggestion for boxes for November. We need a total of 50 to complete the whole quest and its been hard for me to hunt for them. I don't know if it's just me but still, I'd want its drop rate to increase. Thank you for posting your suggestion here. When players post suggestions directly to my pm, I tend to forget when I make item list. Sure, I'll include in next item list, along with Mizzo's suggestions above. Is Brad Earl Darkness web compound fixed this patch? My apologies if this were reported in last patch note and I missed it. If it were reported elsewhere, I also missed it. Now that this is reported in this patch note, I'll make sure not to miss it. I'll see if it can be fixed soon without waiting for next maintenance. Brad Earl is fixed on website. Ok, Daniel. You have been asking this for many times already. Although it was planned for Dec, we'll make it Nov.
to bring out different content every maintenance. This is a good idea. Idk if GM/Coders could make them but I'll propose in next item list. How about a pink one; can you make a pink one? 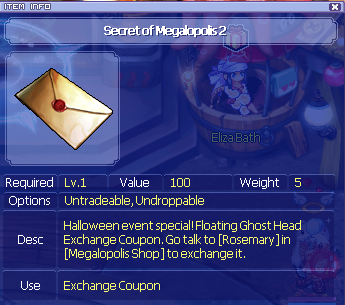 The item description for Secret of Megalopolis 2 is interesting.... Rosemary won't let me use it as an exchange item..... Hahaha! Following up on FoXiv's suggestion, I would like to suggest an Amethyst Elixir to Amethyst Elixir EV in the poppuri's exchange list ... But if Amethyst Elixir EV doesn't exist then never mind. Now that we already have the invisible skins for the cape and hat in MyShop, how about adding invisible skin for sword and shield (not for gun type)? Sorry about this post I am also new in here. Also does anyone have screenshots for the Araiana Wings?